'Twas my first evening in San Diego. After strolling along the coast in La Jolla Cove and watching the sunset, it was time for dinner. Fellow blogger Rodzilla (who, by the way, is moving to San Diego soon) had given a multiple thumbs up to Kaito Sushi in Encinitas, which was an 18-mile hike from La Jolla (26 miles from downtown), and this would be the only night I could go as I only had the rental car for one evening. Between the distance, fatigue (I had been up since 2 am PST after only four hours of sleep and traveling all day), and starting to come down with what would eventually become a nasty robbed-me-of-my-voice cold, I came very close to not making it up there at all. After all, Rodzilla had other recommendations closer to town for me that all sounded really interesting. In the end, however, I knew Kaito was one place I would regret not checking out. 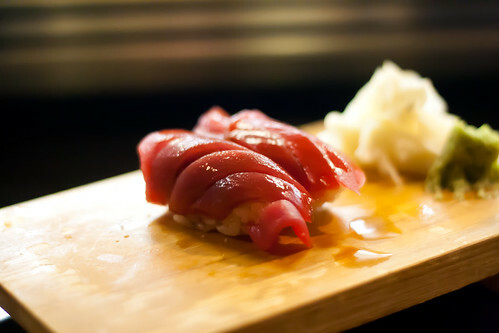 Besides, don't I keep saying I need more sushi in my life? So off to Encinitas I went. Kaito is not easy to find. It is inside the same strip mall as Kohl's and Five Guys, but it doesn't have a big sign above the restaurant like every other store and restaurant in the mall. I finally had to call them and they were very helpful in getting me to the right spot (which wasn't too hard as I was already in the right mall). Phew! 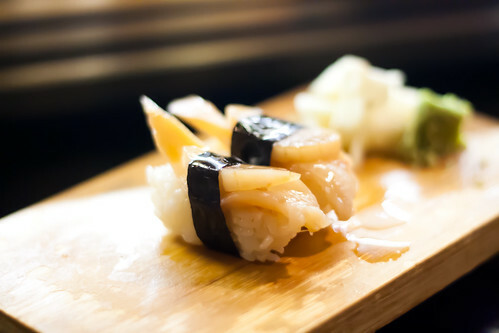 Kaito's space is small and unassuming, and the sushi bar takes up a whole half of the restaurant. 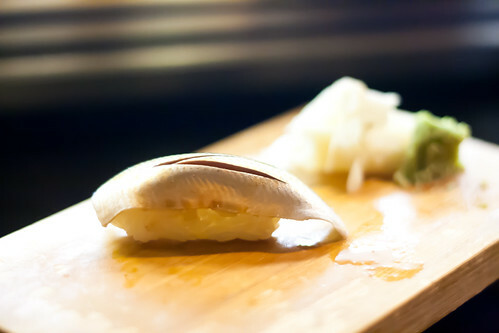 I was there for omakase, which means chef's selection, and it's a good thing I'm game for almost anything. I noticed several customers already seated in front of the famous Chef Kaz, and I was directed to a seat in front of Chef Joe. Being the only one on Joe's side of the bar meant I had 100% of his attention. It was like having a personal chef! Awesomeness, I say. The food came fast and furious! 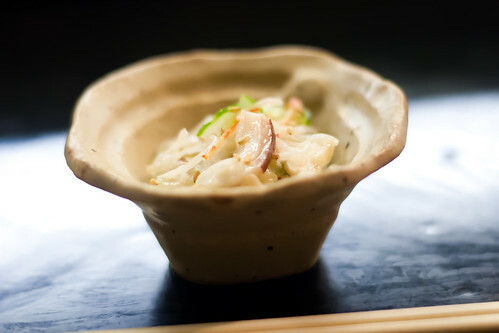 As soon as I sat down, I was presented with a salad, but it's not like any other salad I've had at other Japanese restaurants, which are often composed of iceberg lettuce and forgettable miso dressing. No iceberg lettuce in this Kaito salad! Instead, I found some lovely squid and crabmeat. My first real course was Sweet Shrimp Sushi, which was completely the opposite of the overcooked shrimp you normally get at many other sushi restaurants. 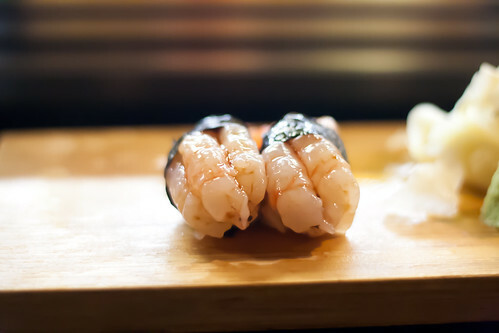 Each sushi was topped with three shrimps wrapped together, and the shrimp was decidedly very fresh. 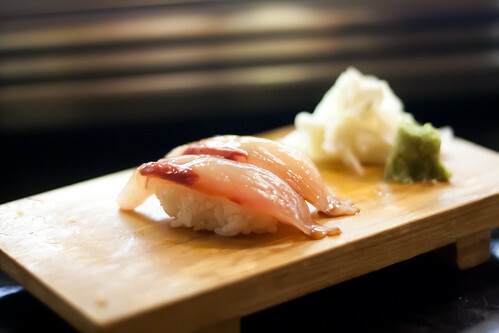 My second course was the Snapper Sushi, which was lemony and a little spicy, and very good. Then came the crispy, deep fried Shrimp Heads that were very well seasoned. I assumed these were the heads of the sweet shrimp I had enjoyed two courses ago. I didn't know this before, but the shrimp heads were meant to be eaten whole - yep, eyeballs and all! - but do be careful not to poke your throat with the sharp parts. The next course was was Kampachi (amberjack) from Hawai'i, which I'm not sure I've ever had before, and they were amazing. ...and the Toro, also from Spain. Both were great, but I was pleasantly surprised by the toro which was flavorful and melt-in-your-mouth good. And then, there was Clams from Massachusetts. Again, so crazy fresh, to the point they were "crunchy." At this point I was starting to get quite full. I told the chef I would stop at just two more courses. So for the next course, Chef Joe decided to serve me just one piece of the Kohada (gizzard shad) that's only available from Japan. 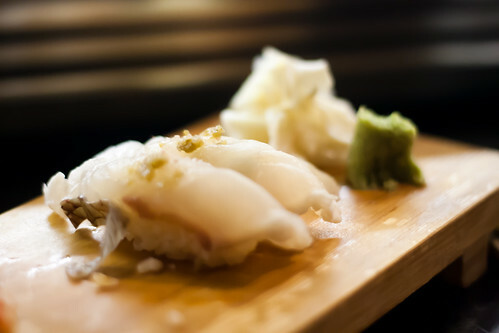 It was Chef Joe's favorite as he grew up with this fish. It had a pretty strong "fishy" flavor, almost like sardine, so certainly not for the faint of heart (or tastebud). 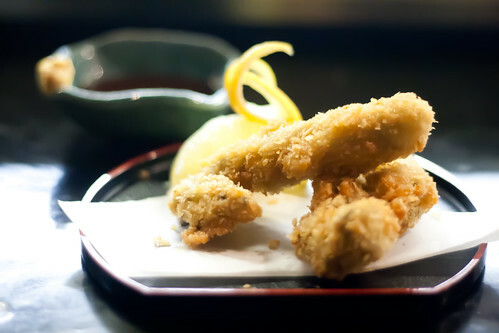 My final course was Deep Fried Hama Hama Oysters from Washington state. 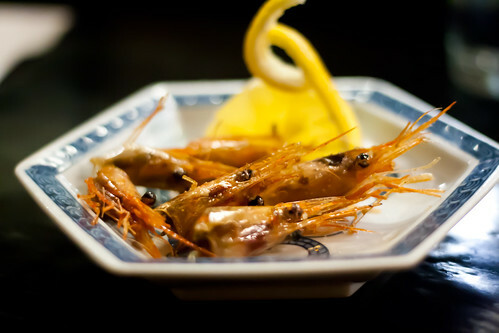 They were perfectly done; crunchy on the outside, soft on the inside, and came with mustard as well as a tomato-based sweet sauce made with carrots, garlic, and onion that the chef explained is a typical sauce the Japanese use to dip seafood in. During the course of the dinner, I asked Chef Joe what makes his sushi so much better than the rest. He thanked me, and said they source from the best fish companies and use the fish the same day they receive them so nothing is ever frozen. 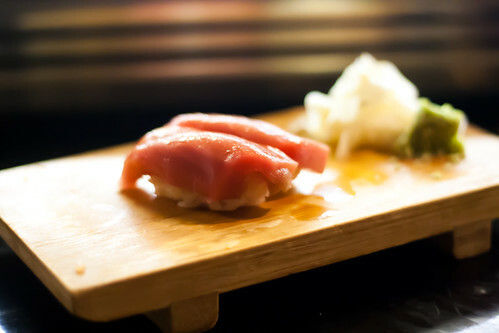 It was clear that this was some high quality stuff, and the food was most absolutely worth the drive up the coast for! I also enjoyed the personable service I got. Talking with Chef Joe while he prepared and I dined was quite a lot of fun. I also noticed many regulars at the restaurant on this Wednesday night - I knew they were regulars from the way the chefs greeted them as they walked in. Clearly, Kaito has a following, and I can certainly see why. Hey, I came all the way from Pittsburgh, and would dine there again if I ever find myself in the neighborhood in the future. Thanks for another great find, Rodzilla!